Welcome to NaPodPoMo Day 2! Two days in a row now I’ve had to edit the show because I can’t control my levels. Gah. Interesting, but rather melancholy, choice of track yesterday. 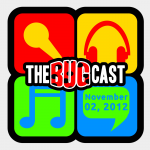 Don’t forget The Bugcast episode 235 at 21:30 UTC tonight in the chatroom – you could be on NaPodPoMo Day 3! Aw, thanks for the nice mention! I love your show! I’ve never felt that my NaPodPoMo’s all had to be the same show. All of the past NaPod’s, I’ve been a part of different shows in one way or another, and I just considered whatever show I did for that day to my daily podcast. Nothing wrong with doing it your way, tho. I think the extra effort is cool.